UCC will hold a live Online Q&A session for prospective undergraduate students tomorrow, Thursday 26 January, 3-5pm. Participation is easy - students can simply go to www.ucc.ie/caolive and type in their question. Registering to participate is not required so anonymity, if preferred, is guaranteed. A panel of staff from around campus will be on hand to answer all queries. We have been finding that this is a forum that this age group feel comfortable in, so we ask that you encourage your students to join in! Applications will open on February 7th, 2017 and close on March 7th, 2017. The link to the Application Portal will appear on the UCC Campus Accommodation website on February 7th 2017. Allocations per category i.e. First Year Students; International Students etc. are predetermined by Campus Accommodation UCC Ltd. Applications received before the closing date and with a valid CAO number will be included in the random selection lottery. Rooms will be offered to successful applicants, by e-mail, in the first round of the lottery at the end of March 2017. Successful applicants are required to confirm within one week, i.e. pay the Booking Deposit of €250. Once the initial room offers have been made; all remaining applicants are placed on a Waiting List. As cancellations come in during the summer and are processed up to the beginning of the academic year, the lottery continues and rooms are offered to students on the Waiting List. Accommodation for all eligible CAO students is determined by this lottery system and probabilities of receiving a room are the same, regardless of when the application is made between February 7th and March 7th. In the case of cancellations, €200 is refunded, from a deposit of €250. Do you want to know more about NUI Galway? Are you searching for information about a particular course, wondering about accommodation options, have questions on fees or interested in what student support services are available to you, then we are here to help! Visit our dedicated CAO website to get an insight into university life and studying at NUI Galway. Please see the following information about the UCD Ad Astra Scholarships and upcoming deadlines. A reminder that the Ad Astra Academic Scholarship now has an online application system. To be eligible for this scholarship, students must receive 6 H1's in the first sitting of the Leaving Cert and complete the online application. If you think you'll get 6 H1s please apply! This consists of a personal statement and a statement of achievement ‘beyond the classroom’. Closing Date: 25th August (TBC). However we would encourage applicants to apply before mid-July. No late applications accepted. Selection: Panel will review and invite shortlisted applicants for interview at the end of August / start of September. Only those shortlisted will be contacted and students must be available on the interview date. Successful candidates will be notified before the start of term time. If a student meets the academic criteria but has not submitted an application they will not be eligible. Application Closing Date: 31st January 2017 online via our website: www.ucd.ie/adastraacademy/sports/applications . No late applications permitted. Selection: Panel will review and invite shortlisted applicants for interview in March and April. Only those shortlisted will be contacted and students must be available on the interview date. All applicants who are interviewed will be notified of their outcome in April. Some students may be put on a reserve list. Some provision may be made for successful candidates who do not attain the required points for their chosen degree but who can show evidence of ability to undertake their chosen course. Further details are available on our website www.ucd.ie/adastraacademy/sports/applications . Performing Arts consists of drama, music and dance. Application Closing Date: 31st January 2017 online via our website: www.ucd.ie/adastraacademy/performingarts/applications. No late applications permitted. Selection: Panel will review and invite shortlisted applicants for auditions and interviews in April and May. Only those shortlisted will be contacted and students must be available on the interview date. All applicants who are interviewed will be notified of their outcome in June. Some provision may be made for successful candidates who do not attain the required points for their chosen degree but who can show evidence of ability to undertake their chosen course. Further details are available on our website: www.ucd.ie/adastraacademy/performingarts/applications . Each new Ad Astra scholars will receive a bursary of €3,000 which they can choose how to spend; they are guaranteed on-campus accommodation (bursary can be used towards this); academic mentors; high performance gym for sports; rehearsal space for performing arts; team building events and more! For further information on each of the strands benefits, please visit www.ucd.ie/adastraacademy or email adastraacademy@ucd.ie. DCU will be hosting a CAO Information Evening on the 18th of January 2017. The event will take place between 6-8pm in the School of Nursing and Human Sciences on DCU Glasnevin Campus. DCU Academic Staff and Support Staff will be about throughout the evening to help answer any of your questions about courses, studying and life in DCU. If you cannot make the CAO Information Evening there is no need to worry! We will be holding a Live Q&A Session on Wednesday the 18th of January between 4-6pm online. Please see this link for a useful CAO checklist. If you haven't registered yet please register asap and put down your preferred Level 8 and Level 6/7 courses, remember you can change your mind later. It is good practice to put your choices down on your application, it will help you decide what you really want and it will lessen the stress about your choices. Please see Ms. O'Connor if you need help with your application. Event Information: On Wednesday, 18th January 2017, UCD Engineering will welcome 5th and 6th year students, A-Level students, mature applicants, parents and teachers to an evening on Engineering at UCD. Admission is free but pre-booking is essential. Use the booking form here to book your place. Please note the following important dates for CAO deadlines. If you haven't registered please do so now here. 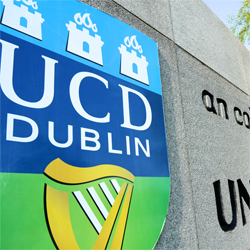 Please see here for UCD's dedicated CAO website for 2017 applicants. The following Colleges of Further Education are hosting Open Days for their Level 5 and 6 courses, many of which have links on to Level 6, 7 and 8 courses in the ITs and Universities. Please see HERE for links to these courses.